What do they tell us about Mars Evolution? 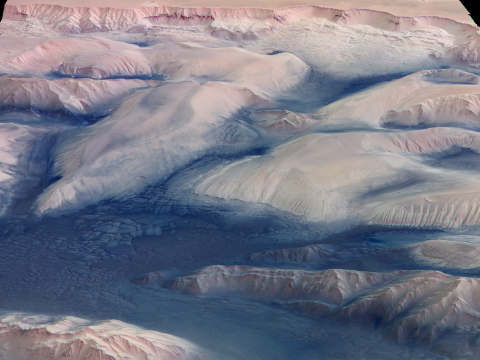 The proposed study aims at understanding of the nature and origin of so-called Interior Layered Deposits (ILDs) on Mars. 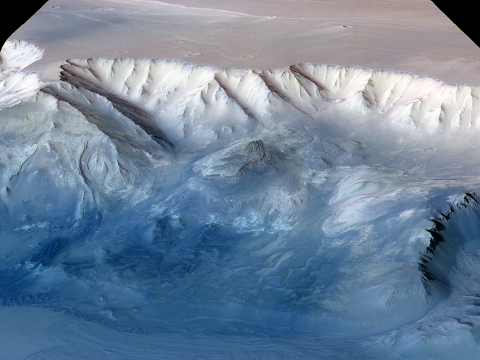 These deposits are associated with the most abundant outcrops of hydrated sulfates on Mars, and thus are likely to preserve a record of liquid water in Martian history. The significance of sulfate-bearing ILDs as indicators of the past climate conditions on Mars, makes them prime targets for future in situ investigations by lander missions such as Mars Science Laboratory and ExoMars, which focus on the search for past and present habitable environments. 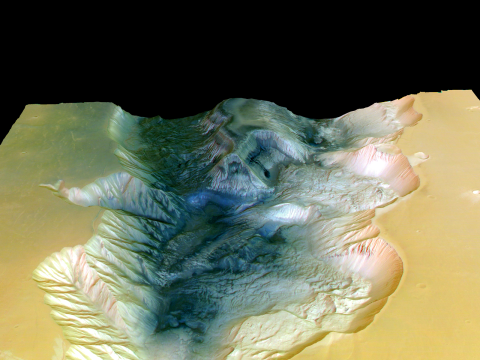 ILDs are mainly found in the equatorial regions, usually in topographic lows, such as Valles Marineris, chaotic terrains, and large impact craters. Layering is visible on metre scale, and partial erosion reveals intricate intersection patterns between geological layering and the topography. 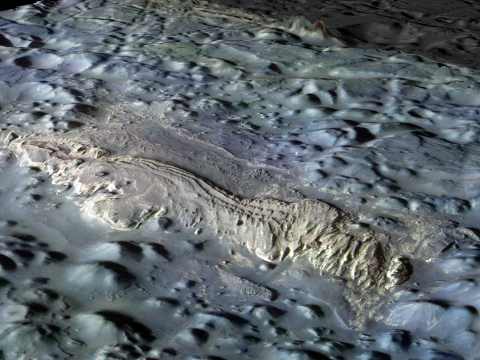 The process by which these deposits formed has remained enigmatic, despite enhanced image and spectral resolution from orbit. Potential genetic models include lake and river deposits, wind-blown sediments, sub-aerial or sub-glacial volcanic deposits, and most recently evaporitic deposits in a spring environment. It is our goal to put constraints on possible formation mechanisms, since the potential for these units as a record for habitable environments strongly depends on the process by which they formed. Our goal is to bring together scientists with diverse, but complementary expertise, in order to systematically analyse a representative number of ILDs, using an integrated set of data currently available from Mars Express, Mars Global Surveyor, Mars Odyssey, and Mars Reconnaissance Orbiter. Analysis of remote sensing data will be supported by analogue studies and geochemical modelling. This approach will enable a critical assessment of the various existing genetic models for ILDs. We will define key-observables, from current or future missions, which will allow the various hypotheses to be tested. Our cross-disciplinary study is expected to provide strong constraints to the astrobiological potential of ILDs on Mars. 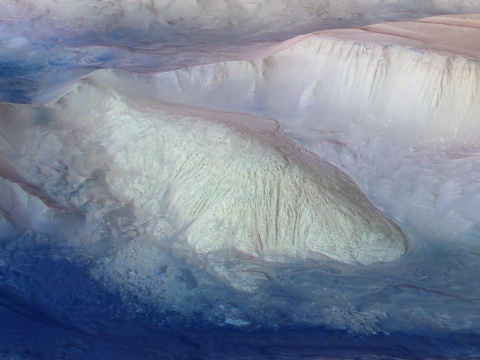 Examples of ILD in Valles Marineris. 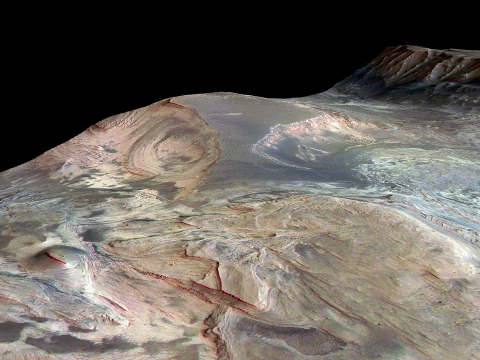 All images are perspective false-colour views synthesized from HRSC data. Click here to download pictures in original size.